SoundTaxi Media Suite contains a sound and video converter, which easily converts any type of sound or video to different format. Furthermore it removes DRM without any problems at all. The second tool is a web video downloader. It enables you to save videos that otherwise only can be watched online. The third tool is a music downloader. This tool can find and download almost any song ever made. For free! The last tool is a radio recorder that lets you save music from tons of web radios. SoundTaxi Media Suite a fantastic package of great software. 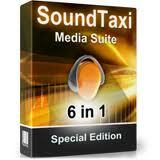 Soundtaxi Platinum This version can convert audio files. Max 2 audio files at the same time. Max speed is 6x. Soundtaxi Professional This can do the same for you as Soundtaxi Platinum. It can however convert up to 16 audio files at the same time with 50x the speed. Furthermore this version can rip and burn CD's, it provides free updates for the program and it can save music directly to iPods, iPhones etc. Soundtaxi Pro+VideoRip This version offers the same as the Professional one but it can also convert video files. Furthermore this version contains a feature that enables you to download video directly from videosites through Internet Explorer Soundtaxi Media Suite (You are here now) This is the ultimate Soundtaxi solution. It offers the same as Pro+VideoRip and then some. Soundtaxi Media Suite furthermore enables you to catch and save video while surfing. It can also find and download any songs that you crave for free. It lets you play almost all kind of online radio stations without limitations and it even lets you save the songs that they play. It can copy, rip and backup any kind of DVD and last but not least Soundtaxi Media Suite can burn data, audio and movies to CD and DVD. Find SoundTaxi Media Suite, mark it and choose "Uninstall"
Should SoundTaxi Media Suite has been damaged or corrupted and thereby difficult to remove we can recommend you finding help to uninstall it here.